_Understanding the construction process truly and being knowledgeable about it is the prerequisite for being a partner to the building sector. We have this understanding from the initial planning stage through to completion of construction. _Understanding such as this is based on 40 years experience in self-climbing technology and more than 1000 High Rise projects that were successfully realised worldwide. Construction of the world's tallest building, the Burj Khalifa in Dubai and the 1-km high Kingdom Tower in Saudi Arabia set to surpass it, are but two examples. With this comprehensive know-how, we are well-qualified to be your high-performing and reliable partner in High Rise construction. A new Novotel hotel building will be a feature of London's ever-expanding skyline. Visible from afar, the prominent surfaces of the protection screen Xclimb 60 have already been put to good use advertising the hotel during construction. Omkar 1973, the new landmark in the heart of Mumbai was named after its location at 19 degrees latitude and 73 degrees longitude north. The three towers measuring altogether 800 m offer luxury in a class of its own. 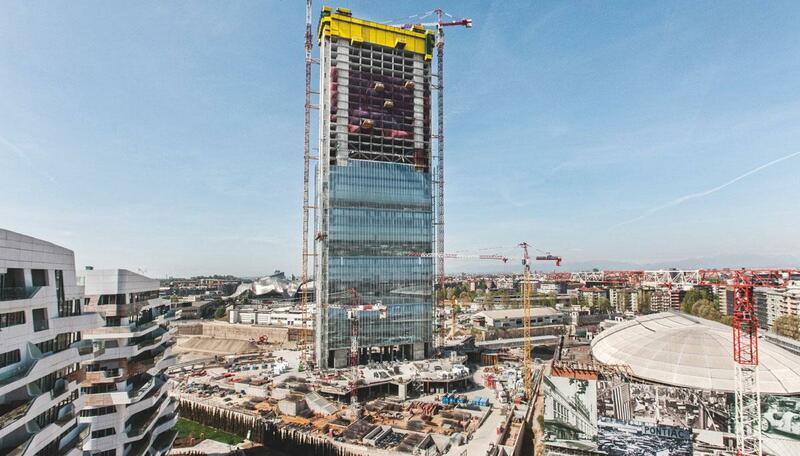 Doka supplied the formwork solution for the automatic climbing systems for all three towers. South Beach is a landmark project in downtown Singapore. This project is a combination of new construction with the restoration of existing buildings, housing a mix of office at The North Tower and hotel, retail and residential spaces at The South Tower. In scenic San Francisco, a 52 story condominium building is currently rising to the sky to provide additional housing to the rapidly expanding area. One Rincon Hill Phase II is a 299-unit residential development, which is designed to achieve LEED certification and is a companion to the existing 64-story Phase I tower. The tallest building in Monaco (170 m) is currently under construction. The special requirements of this site (space constraints, curved structure geometry, stringent safety standards) have been met by using Protection screen Xclimb 60 with Framed enclosure Xbright, and Dokadek 30. A new office-building for the dutch Ministry of Security, Justice and Internal Affairs was built with Doka formwork-solutions in The Hague (Dutch: Den Haag) the capital city of the province of South Holland in the Netherlands. Tour Carpe Diem is the name of a high-rise building in the business district of La Défense in the Paris suburb of Courbevoie. The 166 m tall office building (antenna peak) consists of 38 above-ground and two underground floors. Planned according to Green Building Standards, the tour has capacity for around 3,000 jobs. On the INDX condominium project in Toronto, Doka in partnership with Hardwall Construction developed a new hydraulic protection screen system to climb 7 platforms for the next casting step at once in one hour with no crane. The system incorporates a 16 ft loading platform to provide storage and laydown space outside the building perimeter at great heights. A large-scale infrastructure project has been under way in Istanbul since October 2012. The new district is named Ağaoğlu Maslak 1453; it will be home to office buildings, apartments, a hotel and a modern urban entertainment centre with shopping mall on an area of 325,000 m². Doka delivers the formwork solution for the heterogeneous architecture that includes five high-rise buildings. The building tapers continuously as it rises. It is topped by a 48-metre high illuminated crown made of special glass. In the dusk and at night-time the skyscraper will stand out as a unique light feature in Malaysia's capital. Project owner is Indonesia's Mulia Group, which has planned the project with 106 floors primarily as office space. The new headquarters of the National Bank in Lima, Peru, offers 66,580 m² floor space and is 134 m high. With its two building facades inclined by 2°, the design reflects the balance between tradition and modernity. Using Doka formwork solutions, the bank's headquarters were erected in short time possible and in compliance with high-level safety requirements. With an area of 450,000 m² assigned to residential, office and shop space, "Crescent City and "Crescent Place" will be the new centre of Baku. Its 205 m height and 41 storeys allows "Crescent City" office tower to overlook the area. Next to it is "Crescent Place", an 8-storey shopping centre that supports a 174-m residential tower accommodating 168 apartments; Hotel "La Luna" with its unusual shape is the third structure on the site. The skyline of Dubai, the city in the Arabian desert, is enhanced by an architectural masterpiece. The Damac Towers project includes four towers connected by a podium: three of them are residential buildings and the fourth one a hotel. The business complex is a platform for cooperation between Guagdong, Hong Kong and Macau. With the Automatic climbing formwork SKE100 and SKE50 as well as the Wall formwork Top 50, Doka delivers a highperforming and efficient formwork solution. Due to the frequency of precipitation and typhoons, perforated plates were used to fully enclose the working platforms. Corrugated steel sheet was used as weatherproof platform decking. Use of an ideal mix of SKE100 and SKE50 plus automatic climbing formwork allowed for rapid and economic progress in the core construction. Our protection screen Xclimb 60 with framed enclosure Xbright ensured maximum safety and sealing tightness in the facade area. The new headquarters of the European Central Bank (ECB) is rising on the right bank of the River Main, on the site of Frankfurt's former wholesale market hall. At 426 m to the roof, 432 Park Ave. will be the tallest building in New York City. It surpasses the old as well as the new World Trade Center buildings and comes in second only to the One World Trade Center in overall height. Doka formwork was used in Dubai to help construct the world's tallest building. Doka supplied the formwork solution for the entire structure core. Inspired by an Arabian desert flower, the shape of the tower meant that the formwork needed to be highly adaptable. In addition, the extremely tight construction schedule necessitated an ingenious utilisation plan. With an overall height of 555 m, this 123-floor super-highrise is set to become the tallest building in East Asia. Doka is supplying the automatic climbing and wall formwork for the entire core, the surrounding mega columns and the façade. This exceptional new landmark of the Korean capital is scheduled for completion in 2015. A new district is developed in Milan and along with it a new poster child for the lifestyle city: with its 202m, Torre Isozaki will be Italy's highest building. Doka is supplying the all-in-one formwork solution. Regalia Sunny Isles Beach, south Florida's future ultra-luxurious residential building is constructed with the fastest automatic climbing formwork in the US market, the Super Climber SCP. As a result, the building contractor was able to stay on schedule and optimise man hours on the project. When finished in late 2018, Malaysia's The Exchange 106 super-highrise will soar 492 metres into the sky. The Exchange 106 will be even taller than the world-famous Petronas Towers, which top out at 452 metres. Sound advice begins immediately after the tender phase or a building. Because from this point on, it's all about cost efficiency and having a leg up on your own competitor. Which is why the our internationally experienced experts at Doka make a point of advising you very early, and very thoroughly. Doka technicians work to put together the most suitable formwork solutions in combination with high-performing service packages, exactly tailored to each individual situation and to the requirements of the structure. Regardless of how different and unique, one thing holds true for all High Rise projects: our commitment to the formwork solution has one common denominator — to design a construction process that is fast, safe and as good as it can be. Based on your project's unique requirements, Doka provides comprehensive solutions for all cast-in-place concrete components in your highrise project. This refers, in particular, to the areas of core, floor, props and façade. Load-bearing designs for façade construction support the subsequent systems. The building's footprint and its development as it gains height are unique to every project. These geometric boundary conditions such as changes in wall cross-section or inclination and the resulting complexity, as well as the number of storeys, are crucial for selection of the right formwork systems. Smooth and efficient construction process depends on a functioning site infrastructure. Good formwork solutions ease the workload, support concrete placement and provide a sufficient amount of storage space and load capacity. The investment in formwork systems pays dividends. A solution customised to meet your project's unique requirements saves resources, as well as time and money. We achieve all this with quality-tested formwork systems and an all-inclusive project solution. We work with our customers to develop project-specific safety concepts. From operating and implementing the formwork to stair towers, safeguarding floor edges and enclosing the climbing scaffold. On a core build, 25-50% of the time in a cycle is spent on reinforcement activities. With a formwork solution designed specifically for your project, you'll benefit from the following: a large workspace between the reinforcement and formwork, or additional working platforms that allow you to perform formwork and reinforcement activities in parallel and further advance your construction schedule. Observing cycle times – usually 3-5 days – has considerable impact on the progress of the entire project. Detailed planning of system formwork, commissioning quantities and personnel resources is critical for ensuring complete success. _Understanding how safety takes you to the top. Our modular system-based 'construction kit' offers the right climbing technology solution for the entire range of High Rise projects. No matter whether they are crane-dependent or crane-independent, what they all have in common is this: highest safety standard combined with ease and speed of handling. _Understanding how to take a load off you. We are happy to support our customers in any phase of their formwork projects. Because we are a single-source for products, services, planning, project management and logistics. This takes a lot of pressure off your site engineers and foremen and lets you accurately calculate the costs of the forming operations. _Understanding of all aspects such as ours is rarely found. The international experience of Doka gives you pooled, concentrated knowledge for a successful project. Your contact person will help you find the best individual solution, to make your project's 'bottom line' a success, too. In short: expert specialised formwork planning with lasting benefits for your highrise construction project. Thank you for your interest - High Rise construction. Thank you very much for your interest - High Rise construction.